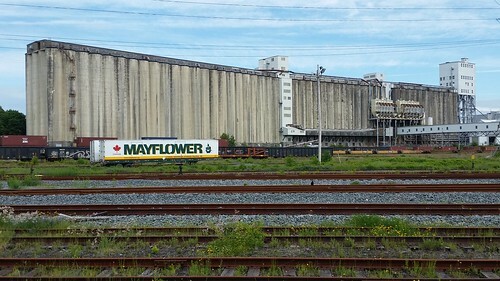 The end of a railroad where it mees with a shipyard and a giant concrete building where there appears to be some kind of production going on as well as a "Mayflower" shipping truck. I found this image a bit haunting and curious. I had run by it the day before while exploring Halifax but came back for a walk earlier today to capture it. There's an element of industrialized destitution with the rusted train tracks, the massive, water-stained concrete building, and the train carts allow which seem to be slowly getting swallowed by the abundance of green weeds. The Mayflower truck are curious because it's a moving and storage company out of Halifax named after the Mayflower that came to Massachusetts (that seems likely given that the icon next to the right of the title is a ship). All of it seems foreboding or strange--something almost alien. I would love to go exploring in there as if it were an abandoned lot but it was also clear that there is a good deal of bustle as those train carts had disappeared hours later when I returned.